Here we are with another Irish Eyes 2 Slot game. There are simply hundreds to choose from, all playing on the glorious traditions of the Emerald Isle, the Luck of the Irish, 4 leaf clovers, lucky leprechauns, and so on and so on! Irish Eyes and it’s follow up, the cannily-named Irish Eyes 2 are amongst the more popular of this particular genre of slot. To be fair (or sure) NextGen have done a beautiful job on the graphic and animations here – there are gleaming green and gold symbols and a pleasantly lush meadow forms the backdrop to the reels. There are 5 reels and up to 25 paylines to play, and the highlight of this video slot comes in the bonus round with up to 20 Free Spins to claim with up to 5x multipliers. The Irish Eyes 2 RTP (Return to Player) is 95% and the volatility rating is medium. You can play this NextGen slot for free or for real on your mobile, tablet, or even on your desktop should you choose. We recommend you try it at one of our favourite casinos, Casumo. Play right now, or read on for our full review, with an explanation of the features and gameplay. The NextGen studio rarely lets you down with the quality of its graphics, illustrations and animations. The Irish theme always lends itself to some good-looking slots, and dare we say it, the treatment here is pretty tasteful. The key symbols on the reels are the standard card symbols from 9 through to ace, the 4 leaf clover, the leprechaun’s pipe, and his hat, and the highest paying symbol aside from the Wild, a gold ring. The wild itself is the beautiful red-haired Irish lady, and the scatter is the pot of gold. 5 Wilds can land you up to 5,000 coins, and 5 scatters sets up a win of 100x your stake. So, we are dealing with a game with variable paylines, meaning you get to choose how many you stake on with each spin. You can bet from 1 line to 25 lines, and from 0.01p to £10 per line. There is a typically Irish penny whistle ditty that plays when the reels spin. Most likely it will drive you mad! If so, make use of the sound button to toggle on or off. They key in Irish Eyes 2 is to trigger the Free Spins round, so watch out for the scatter symbol – the pot of gold – which will help you here. Free Spins: The scatter pot can appear anywhere on the reels, and when it does, 3 of them will land you 10 Free Spins, 4 will land you 15 Free Spins, and 5 will land you 20 Free Spins. All your wins during the Free Spins round are subject to a decent 3x multiplier, and Free Spins can be re-triggered when more scatters land on the reels. 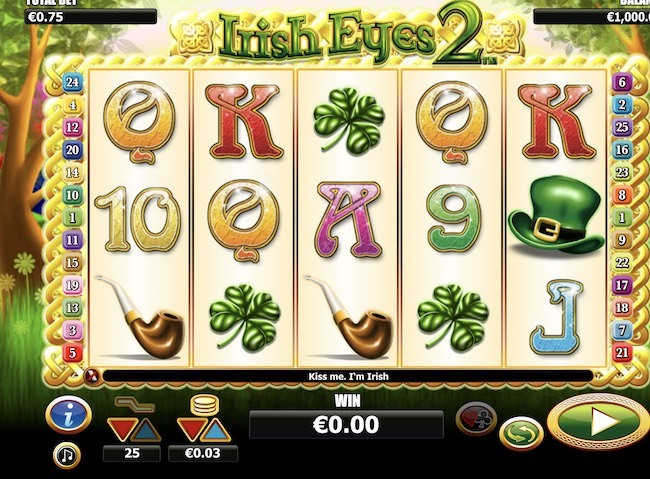 Gamble Feature: Like many other NextGen games, Irish Eyes 2 has a gamble feature. You can choose to gamble any win on the turn of a card. Guess the color correctly and double your wins. Guess the suit correctly and Quadruple them! What’s the best way to describe this game? Simple but effective perhaps. Irish Eyes 2 relies on the simplest of mechanics to get the blood pumping – a Free Spins round with multipliers. But here, the beautiful graphics and the simple gameplay have made this slot an evergreen favourite amongst slots fanatics, and after a few spins, it’s not hard to see why.